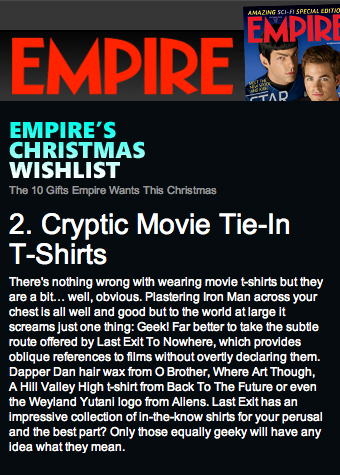 There’s nothing wrong with wearing movie t-shirts but they are a bit… well, obvious. Plastering Iron Man across your chest is all well and good but to the world at large it screams just one thing: Geek! Far better to take the subtle route offered by Last Exit To Nowhere, which provides oblique references to films without overtly declaring them. Dapper Dan hair wax from O Brother, Where Art Though, A Hill Valley High t-shirt from Back To The Future or even the Weyland Yutani logo from Aliens. Last Exit has an impressive collection of in-the-know shirts for your perusal and the best part? Only those equally geeky will have any idea what they mean.